It will be a D-Day in the Big Bash League 2018-19 (BBL) as the final league game of the season beckons. This game between the Melbourne Stars and the Sydney Sixers is equally important for both teams. A win here will have its own set of advantages for either of the teams. However, it is more crucial for the Stars to register a victory, for they’ll be knocked out if they lose. The Brisbane Heat team, after the superlative performance in the last game, will be glued to the television hoping that the Stars lose. It’ll help them qualify for the finals in case that happens. On the other hand, the Sixers will be hunting for a home semi-final with a win here. The Melbourne Cricket Ground (MCG) is surely not one of those highest scoring venues this year. Anything around the 160-run mark batting first should be defendable. Four out of the five games at this venue in this season were won by the teams chasing. Therefore, the toss will play a crucial factor. It will be hot and sunny during the afternoon and the weather is predicted to remain pretty much even throughout the game. The Melbourne Stars have retained the same squad from their last game. Ben Dunk and Marcus Stoinis will open the innings while Peter Handscomb will continue at three. He will be followed by Glenn Maxwell, Nic Maddinson, Seb Goth and DJ Bravo. The bowlers will hope to bring out a better performance in this must-win encounter. Predicted XI: Ben Dunk, Marcus Stoinis, Peter Handscomb (wk), Glenn Maxwell (c), Nic Maddinson, Seb Gotch, Dwayne Bravo, Jackson Bird, Daniel Worrall, Sandeep Lamichhane, Adam Zampa. Nathan Lyon has joined the Sixers squad ahead of this clash and is highly likely to get a game. He will probably replace the 19-year-old Lloyd Pope in the eleven. Josh Philippe and James Vince have got crucial roles to play with the bat. The bowling lineup looks quite strong. Predicted XI: Daniel Hughes, Josh Philippe (wk), James Vince, Moises Henriques (c), Jordan Silk, Jack Edwards, Tom Curran, Sean Abbott, Steve O’Keefe, Ben Dwarshuis, Nathan Lyon. 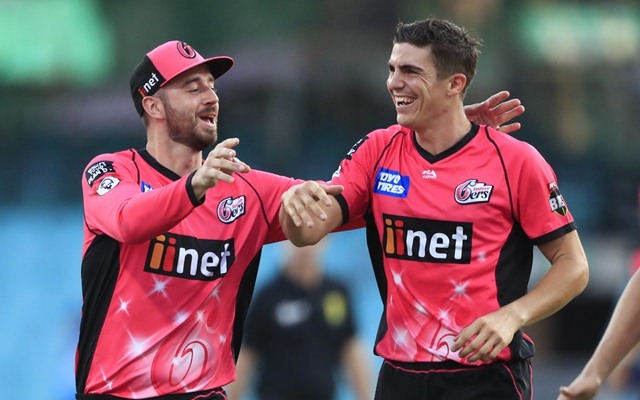 The Sydney Sixers are predicted to win the match.